Discarded plastic bags -- in the billions -- flutter from thorn-bushes across the continent, and clog up cities from Cape Town to Casablanca. Now UNEP and other concerned bodies are spearheading a fast-growing campaign to contain the menace. Their emphasis is not just on curbing production, but also promoting re-use of bags, and recycling of plastic waste. Uganda joins the growing number of East African countries which have banned the plastic bag in an attempt to clean up cities and prevent environmental damage. Currently, only a small number of the bags end up in city dumps. Instead, once discarded, they are blown in the wind, washed into drains and water courses and eventually ground into the earth. Uganda is blessed with some of the richest soil in Africa, but around the towns and villages it is laced with plastic. The government announced that from July 1 the manufacture, import and use of plastic bags thinner than 30 microns will be banned. All other polythene will be subject to a 120% tax. As Kenya chokes from an environmental crisis caused by plastic waste, efforts to battle the catastrophe over the years have come to naught. Conservationists are blaming two culprits: The public, which has refused to shift from plastic shopping bags to environment-friendly ones, and manufacturers, who are frustrating clean-up efforts. Nobel laureate, Prof Wangari Maathai, has been at the forefront in pleading with Kenyans to stop using plastic bags. 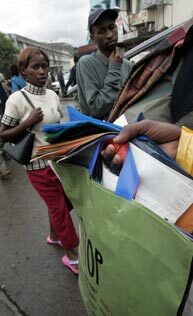 She wants shoppers to carry kiondos, but they continue to use plastic bags with abandon. An upcoming ban on plastic bags in Uganda forces the country to think creatively about alternatives. Instead of relying on paper bags harvested from trees, the government is considering the use of local materials, such as banana fibre bags and papyrus baskets, for carrying items. Our Take: As developing countries curtail the environmental impacts of industrialization, they are re- discovering and revitalizing their local economies and sustainable industries, many of which were abandoned over the past 10-20 years during the initial lure of the plastic bag phenomenon. Authorities on the semi-autonomous Tanzanian islands say discarded bags damage the marine environment and hurt its crucial tourism industry. But the BBC's Ally Saleh in Zanzibar says many people are sceptical about whether the ban will be enforced. Link: Zanzibar islands ban plastic bags. A ban on the use of plastic bags will effect on February 1, forcing shoppers to either provide their own bags or pay for the new-style thicker recyclable bags. Wildlife, environment and tourism minister Mr Kitso Mokaila said in an interview that the new law aims to protect the environment. Plastic waste is the most visible and a major concern because it has environmental implications and there is need for us to manage the problem, he said. Link: Ministry bans thin plastic bags. Tanzania's Vice president Ali Mohamed Shein revealed late Saturday that Tanzanian government has banned plastic bags and containers and ordered people to stop farming and logging on Africa's highest mountain, among other environmental measures. Speaking on state owned television late Saturday, Vice President Ali Mohamed Shein said the government's ban on the importation, manufacture and sale of plastic bags, plastic drinking water and juice containers will take effect in October so that manufacturers and importers have time to find alternatives. "The ban of plastic bags and containers is necessary to protect our rapid degrading environment," said Shein. Link: Tanzania: Government bans plastic bags. Rwanda is cracking down on the use of plastic bags by shoppers, the environment minister has told the BBC. Drocella Mugorewera said that anyone using plastic bags is breaking a recent law on environmental protection aimed at cleaning up cities. She says that people must use paper bags instead. Some shoppers, however, prefer cheaper reusable plastic bags. Some Rwandans accuse government militias of using the law to steal goods being carried in plastic bags. One woman told the BBC's Geoffrey Mutagoma in the capital, Kigali, that local defence staff had thrown the glasses she was carrying in a plastic bag onto the ground. Link: Rwanda gets tough on plastic bags.